An Excel scroll bar can be used for practical (and sometimes boring) things, like testing the effect of price changes, or adjusting a chart's date range. But this is the festive season, so let's use a scroll bar for something more, well, festive! 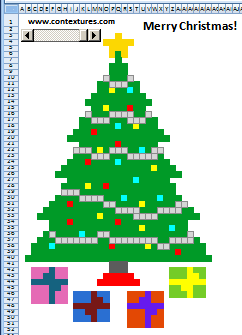 In this example, instead of accounting and finance, you'll see how to use an Excel scroll bar to decorate a Christmas tree, without macros. Unfortunately, it can't make hot chocolate or eggnog, so you'll need to provide your own. 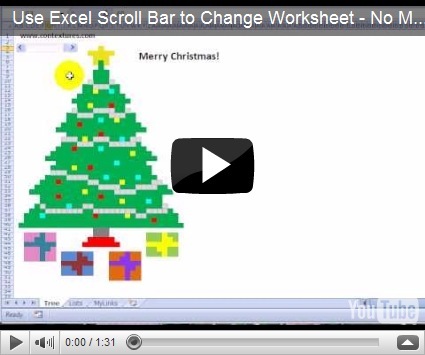 To see how the tree trimming scroll bar works, you can watch this short Excel video. 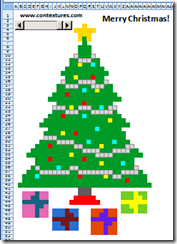 For instructions on creating the Excel scroll bar file, and to download the sample file, please visit the Contextures website: Excel Scroll Bar Christmas Tree Example. It would be great to keep scrolling and see the tree dry up and become a fire hazard (I'm assuming it's a real tree). Thanks Mike, I'll keep that in mind for next year's version. After downloading it, you will need to Enable Macros when asked. To make the lights blink, just right-click anywhere on the sheet; right-click again to make it pause (right-click one more time to unpause it, etc. ).